Aoudad Sheep, while native to North Africa, were first introduced into the Palo Duro Canyon in 1954 by a group of Texas Landowners who were passionate about "wild sheep" hunting and with the cooperation of the Texas Parks & Wildlife Department. "Sheep Hunters of the World" who have been fortunate to hunt both areas are reminded of the close resemblences. 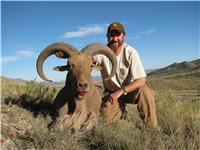 Another release of aoudad sheep was made in the Trans Pecos Mountain Region of Western Texas. This was the State of Texas answer to the vanishing opportunities for Desert Big Horn Sheep that were infected with deadly dieseses transmitted from domesticated sheep. Since then, these free range herds of aoudad sheep have flourished and expanded their ranges to encompass many remote areas of North and West Texas along with portions of Southern New Mexico where they are called "Barbary Sheep." These wild sheep have incredible agility. Their soft spongy hooves provide the necessary traction to climb the steepest and rocky terrain. These sheep have heavy, muscular forequarters that give them the power to climb while their light rearquarters give them the ability to spring effortlessly from ledge to ledge. These sheep can squat and spin 180 degrees in a split second while traversing a knife-edge ledge. They have "no fear" of heights! The exceptional ram may push 300 lbs with most mature rams weighing in around 250 lbs live weight. Aoudad sheep in North Texas will have a pinkish color due to the red dirt found in that region of Texas. Aoudad in West Texas will have a more tanish/brown color to them. The reason for this is due to the fact that sheep spend time each day digging their horns into the soft dirt in an effort to cover themselves in dust to protect themselves from biting horseflies and other insects while at the same time utilizing their front hooves to excavate for nature's mineral licks. Mature rams will have horn bases with circumferences of 12 1/2-14 3/4 inches. Overall horn length will vary with a ram's age and frequency of "dusting" for they actually wear down the tips of their "brushers." Lengths for 8-12 year old rams will measure from 28-34 inches. Aoudad Sheep have a long flowing beard that hangs suspended from their thick neck all the way down to their knees, often referred to as "chaps." Hunters who concentrate their "aim" for the shoulder area will avoid being deceived by this long hair. 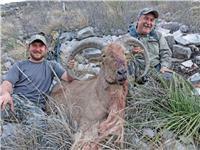 Aoudad Sheep have tremendous eyesight, easily surpassing that of a whitetail buck. Because aoudad are gregarious in nature, approaching hunters must use extreme caution in evading the potential scrutiny from several sets of eyeballs. These sheep are highly intelligent and resent any potential threat that penetrates their comfort zone. The slightest hint of movement on the part of a hunter may result in a "stare down" that may last a full hour. Hunting aoudad sheep, whether in a "preserve" or in a "free range" setting, demands the highest respect from sheep hunters. Texas Free Range Aoudad Sheep hunters can enjoy hunting either the red bluff cliffs in the famous Palo Duro Canyon of North Texas or the High Desert Mountain Ranges of thorny West Texas where sheep hunting is exactly like hunting the Desert Big Horn Sheep without the high price tag! Sheep hunters may also hunt the brush choked gullies and rocky hills of Central Texas where small pockets of aoudad sheep seek refuge after having escaped from neighboring high fence game ranches. Our Free Range Aoudad Ram hunts involve lots of fun 4 wheeling, walking, stalking, and glassing distant bands of sheep through spotting scopes in order to pick out the largest rams. Hunters will enjoy seeing "free range" elk, mule deer, whitetail, javelina, coyote, blue quail and maybe even a mountain lion during their hunt. 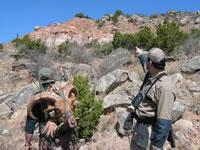 We conduct our hunts on (3) private West Texas ranches that encompass just under 100,000 acres. They are located in the Glass Mountains, Davis Mountains, and Chinati Mountains. These hunts are the purest form of free range and fair chase hunting in Texas. They may also be combined with other big game and small game species for a multi-specie hunt. One of our large West Texas ranches offers hunters an opportunity to hunt in a very mountainous "sheep sanctuary" where large numbers of aoudad sheep are allowed to reach full maturity routinely topping 10 years of age protected from hungry mountain lions by an electrified high fence. 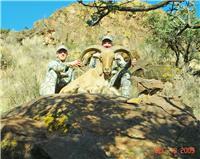 While as challenging to hunt as any of our other ranches, hunters here only pay a trophy fee when successful. Another area we hunt is in the Texas Hill Country which is primarily safari style hunting from a vehicle combined with a short "spot and stalk" over flat ground suitable for most anyone. 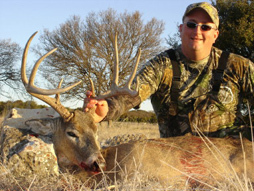 These hunts offer hunters a challenging hunt yet with an increased opportunity for success. While the predominate breeding season occurs during the months of October and November, aoudad sheep will breed year round. It is during the fall when sheep hunters are more likely to locate large dominant rams within a large herd of ewes. Outside of these months, mature rams will split off in reclusive bachelor groups. While these sheep live in harsh, rugged, windblown and arid regions of Texas, their hair/coat quality will reflect little difference between summer and winter, offering hunters a year round opportunity. 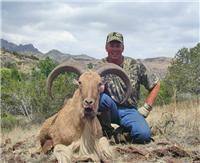 Scroll down to see Aoudad Hunting Videos!